WordPress users - please note that the sign-up and initial setup steps for our video capture plugin for WordPress include the below steps as part of the guided installation we take you through when you install the plugin through your WordPress admin interface. The below assumes that you're registering for the Clipchamp API manually outside of WordPress and are therefore signing up for the API without going through the other WordPress-specific setup parts. Our video API is a Cloud subscription service that provides easy-to-integrate webcam recording, video conversion, and Cloud uploading capabilities for websites and web applications. It converts user videos into highly compressed, streaming-friendly MP4 files (as well as other formats of your choice) and uploads them into a pre-selected Cloud storage service such as Amazon S3 or Microsoft Azure. This article documents the steps to sign up to trialling the Clipchamp API free of charge. This is just a short summary of what the Clipchamp API is capable of by making use of our patent-pending technology. Is the Clipchamp API what you are after? If so it is time to select one of our available plans. They are listed on the API's pricing page. All plans include a 14-day free trial period with no obligation to transition into a paid subscription afterwards. During the trial you get access to all available API features except those in the Enterprise plan. If you decide to move ahead with the API after the trial, select a plan and choose between monthly payments or an annual subscription. The latter gives you 2 months free compared to the monthly payment option. Our plans differ in terms of the usage quota and in terms of the feature set you get access to. Subdomains. All plans cover the productive use of the Clipchamp API on a website domain you specify (e.g., darkside.com). We will automatically also whitelist the www subdomain (i.e., www.darkside.com). On top of that, you can add additional domains and subdomains to enable your API instance on. Simply add these domains into the list in your API settings. Resolution. Our entry-level plans are limited to user-generated videos in standard definition (SD), which gives you DVD-quality (up to 480p) vertical resolution and includes lower resolution files as well (e.g., 360p, 240p). Higher plans give you high definition (HD) resolution (720p, 1080p) or even unlimited resolution, including Ultra-HD (4K). Whenever your plan does not support the resolution of a user-provided input video, the Clipchamp API will automatically resize the video to the greatest resolution that is supported by your plan. Please note that we only put a cap on the vertical resolution in some plans. If your plan's maximum resolution is 480p and a user's input video is 1920x1080, you still get an output video having a resolution of 853x480 pixels. Formats and Codecs. All our plans allow you to produce output videos in MP4 format (H.264 & AAC). Higher-tiered plans of the Clipchamp API add other formats and codecs, such as WebM (VP8 & Vorbis), ASF (WMV & WMAV), FLV and animated GIF. For more information on the output video formats that are supported by the API, please take a look at this article. UI customisation. All plans offer ways to adapt the visual appearance of the Clipchamp API's user interface in the browser. You can change colours and labels, use your own logo and also localise the entire user interface for a non-English speaking audience. Higher-up plans add the "custom button" feature that lets you use your own UI widgets to bring up the video recording and video file selection user interface. The Enterprise plan lets you remove all Clipchamp branding from our service. Additional features in higher plans. 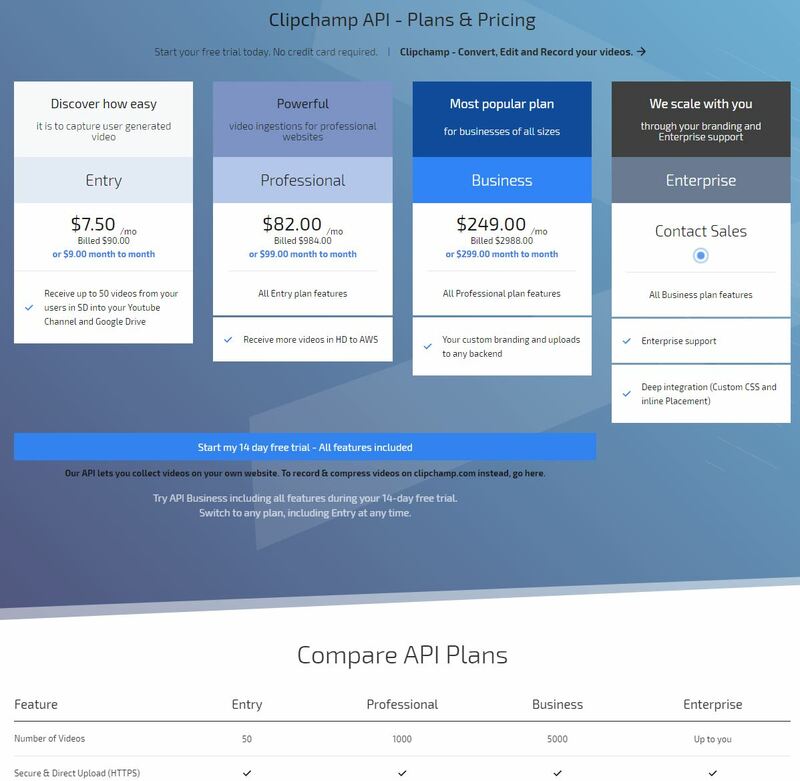 Please see the API's pricing page for a complete comparison of all plans and their feature sets. We are happy to assist you with any other enquiries concerning our plans - feel free to contact us at any time through the contact widget on this page (in the bottom right corner). To sign up to the free 14-day trial, you won't need a credit card. After clicking the button, you will get prompted to select a username and password (or optionally use your Facebook or Google account to log in). You'll then be taken to the API settings page where some additional information is required. Use the Setup Wizard or Manual Configuration to enter some basic information required to embed the API on your website. This includes entering your production website domain (e.g., foo.com). You can also leave the production website domain field blank for now, which will nevertheless let you start integrating the Clipchamp API into your website and let you test it locally (i.e., on localhost) as well as on codepen.io. You can change any settings including entering a production website domain in the API dashboard at any time. After the signup for the trial is complete, you can start integrating the Clipchamp API in your website or web application. Please see this support article that walks you through the initial steps to get up and running quickly or have a look at these tutorials to help you get set up. If you're using our video recorder WordPress plugin, follow the next step after signing up for the Clipchamp API as described in the WordPress plugin tutorial. In addition, all available options and features of the API that you can use to customise its settings for your use case can be found here. Please note that some options are only available on the Business and Enterprise plans.